2018. Various mediums. See images below for specific details. 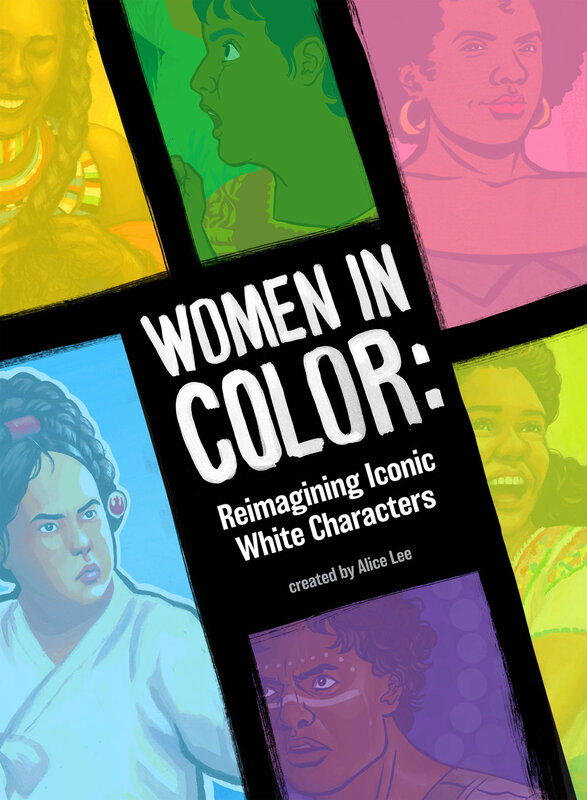 My final undergraduate senior project was to reimagine popular white female characters from books, movies, and other media as marginalized races and ethnicities. My goal for the project was to promote respectful representation and diversity in character design. Diversity is vital and enriching to our lives, and the content we create and consume should reflect these values. As an Asian American woman, I draw from my own childhood experiences of feeling excluded or negatively picked out on the basis of my race. I believe that people of all backgrounds deserve to see their faces and stories reflected in mainstream media. And I especially feel attached to young women of color being part of these images, having been in their shoes and still struggling with these feelings as a young adult. This project aims to reconsider the childhood heroes and role models that we find in movies and books, and to challenge our preconceptions of what feminine beauty and strength look like. The delightfully idiosyncratic book Alice in Wonderland has inspired a rich afterlife in movies and art. Its curious heroine leads audiences through a world full of wonderful imagery and constant befuddlement. Lewis Carroll based the character Alice off of his young friend Alice Liddell, and he lamented the fact that John Tenniel’s illustrations portrayed her as having long, blonde hair when Miss Liddell’s hair was short and dark. I wanted to preserve this aspect of the character as a tribute to him. 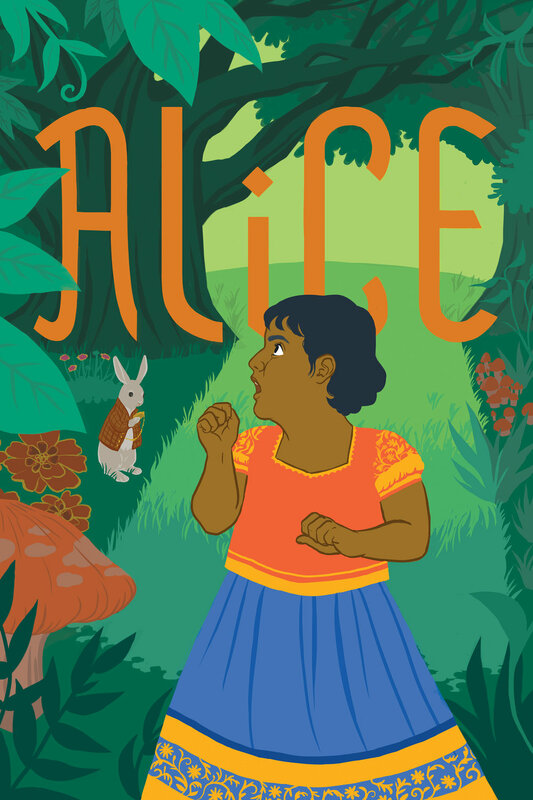 The dress Alice wears is based off of traditional clothing from South India that is known under various names by different Indian states: pattu pavadai, langa voni, or langa davani. It is made up of a kind of blouse and skirt, which are both highly decorated and brightly colored. Young girls may wear this during special occasions, and even perhaps while falling down rabbit holes. The colors orange and green are prominently featured in the image to reference the Indian national flag, which is itself rooted in rich meaning. The thick trees seen in the background reference the unique forms of Banyans, which are considered the national tree of India. Drawn and painted in Photoshop. There is true magic in the 1939 movie The Wizard of Oz that cannot be described. The pure fantasy and spectacle of the movie is carried by the luminous Judy Garland, who famously steps into a world of color with the audience’s awe reflected on her own face. Because of its famous use of Technicolor, I found this movie offered a fun opportunity to put a little more color into the Land of Oz. 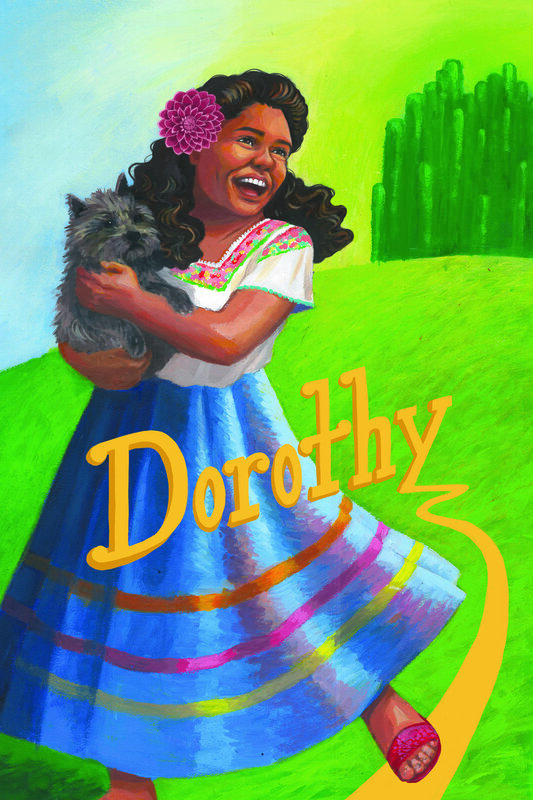 Dorothy as a young Mexican girl wears an embroidered blouse that refers to the traditional huipil tunic worn by indigenous women of the Mesoamerican region. The flower in her hair is a red dahlia, the national flower of Mexico. This image was painted with acrylics as a reference to the murals that arose from the Chicano art movement, which focused on forging an autonomous Mexican identity. Many of these murals were focused on collaboration and building a community, and could be found in public spaces in order to foster inclusivity and accessibility. The volumetric dress and the sweeping movement throughout the painting is a reference to the murals of Celia Alvarez Munoz, a modern Chicana artist. Painted with acrylics, edited in Photoshop. Few female heroines have captivated audiences over decades more profoundly than Princess Leia of the Star Wars franchise. Her strength, sass, and defiance are all characteristics as iconic as her hairdo. While the origins of Leia’s hair design cannot be attributed to one source, I found similarites in her large braid crown styles to those worn by Korean royalty in the early Joseon dynasty. The hair here is inspired by the elaborate wigs and hairpieces that female members of the royal family would wear. The outfit is based on traditional Korean clothing for men, called hanbok, and it borrows from the white oufit worn by Leia on the planet Hoth. I chose the male equivalent of these clothes since it would be more practical for her to wear pants in battle. The pose Leia strikes is inspired by famous promotional photos of Han Solo with his blaster, and it also emulates a publicity shot of Elvis Presley from his film Flaming Star. I wanted this Leia to convey the power and control that she wielded in the Star Wars franchise, and to do so I borrowed from examples of conventional masculine imagery. Painted with acrylics, edited and composed in Photoshop. 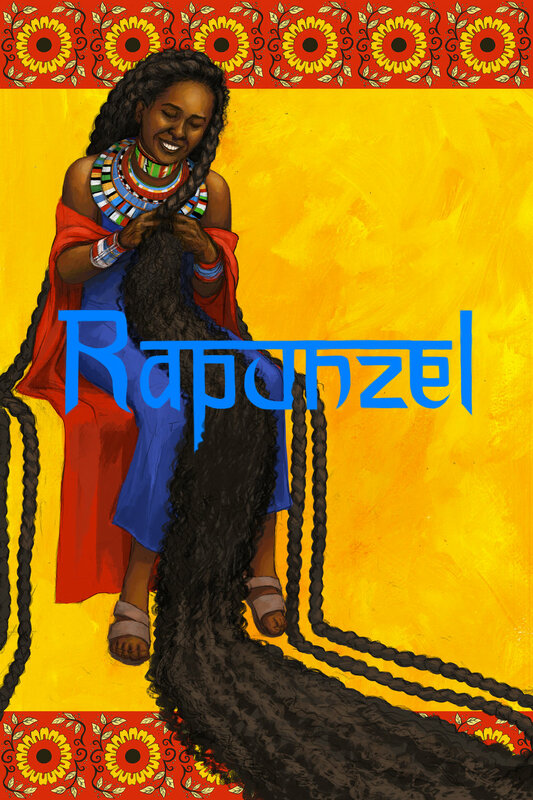 The tale of Rapunzel as we know it today comes from the Brothers Grimm, who in turn borrowed from oral traditions. But the image of a woman with long hair trapped in a tower has captivated imaginations all around the world. Rapunzel is traditionally depicted in children’s books and movies as having flowing golden hair. Hairstyles can be a notable part of cultural identity, and I wanted to explore how to make a meaningful change with a figure that most children become acquainted with in childhood. Here Rapunzel is depicted with traditional jewelry from the Maasai tribe of Kenya, located in the southern part of the country. These intricate pieces were historically made with clay, wood, and bone, but are now constructed with glass beads. The different colors represent moral values and natural elements important to the tribe. The patterns in the background are meant to emulate the vibrant kitenge fabric used in Kenyan clothing. The women of the Maasai tribe famously shave their heads, so having Rapunzel with long, braided hair in the fashion of contemporary African braiding traditions further places her as an outsider, trapped in a prison but dreaming of a better tomorrow. Drawn in pencil, painted in Photoshop. 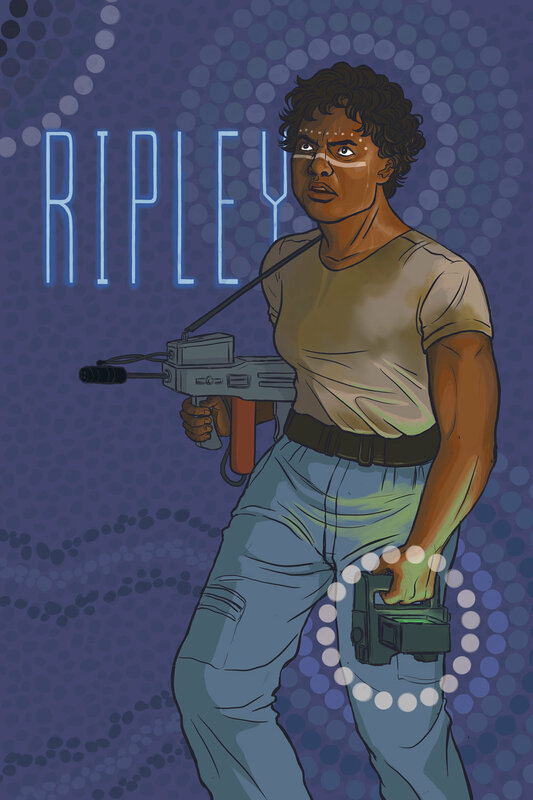 A character that nearly singlehandedly defined a genre, Ripley tears through haunting spaceships and alien corpses with fire in her hands and sweat on her brow. Panicked but poised, strong yet terrified, she is a highly complex and inspiring figure in cinema. Ripley is constantly undermined by male authority in the 1986 Aliens sequel to the original Alien movie. I thought her racial identity could bring a new dimension to the conflict. Here she is depicted as an Aboriginal woman from the indigenous groups of Australia and its surrounding islands. Body painting is an ancient Aboriginal practice rich with meaning and tradition. The painted designs are highly symbolic, and can delineate social positions, tribes, and ancestors. It is often used for ceremonial purposes. The background designs reference the patterns that often appear in Central Australian art, which have manifested in contemporary forms like the Papunya Tula art movement. The radiating circular shapes are also meant to represent the motion tracker in Aliens. At the deliciously corny conclusion of the 1978 film Grease, former goody two-shoes “Sandra Dee” turns heads and drops jaws as she struts out in an unforgettable outfit, from heavily teased curls to the iconic leather pants. Though the movie is set in the 1950s and is likely taking place during the burgeoning civil rights movement, there are no notable black characters. With the black leather and big hair in Sandy’s outfit, I found a fascinating coincidental link to the aesthetics of the Black Panther Party. 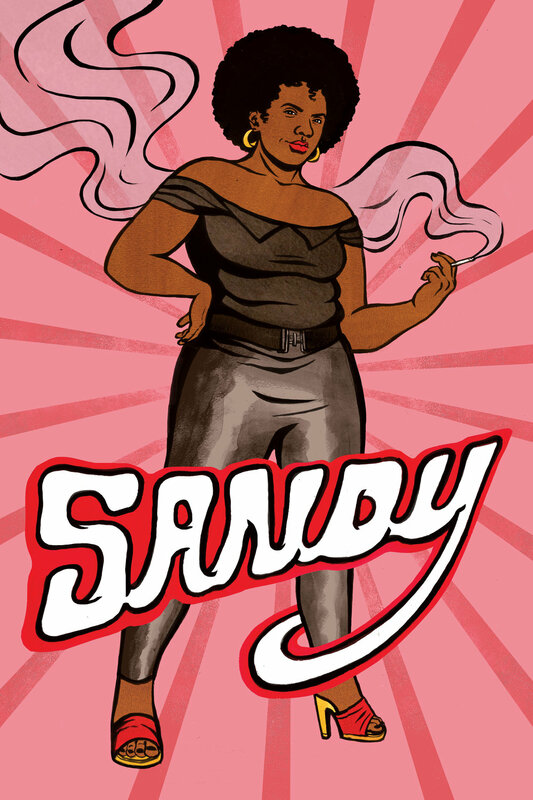 Sandy here has a natural afro as a tribute to natural hair movements that celebrate black culture and beauty. Since Sandy originally is a popular cinematic figure that visibly promotes thin, white, blonde beauty, I wanted to combat some of those standards with a Sandy that was beautiful just by being herself. The background pattern is a homage to the graphic art of Emory Douglas, who was the longtime Minister of Culture for the Black Panther Party and produced many posters and material on their behalf. Drawn in ink, painted with acrylic inks and watercolors, composed in Photoshop.